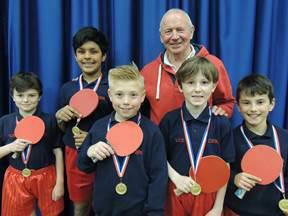 he final district table tennis fixture of the season proved to be a thrilling event. The match was against our local rivals, Farnham Common and as expected it was a very closely fought event. Winning two matches a-piece, it left one to play. Sonny Dalston battled against his opponent, both winning two games each. With the final game to play, it couldn’t have been closer! Sonny held his nerve to strike two wonderful passes across the net to win 11-9. A special mention for Luca Mailey who stepped in at the last moment for the injured Oliver Evans and managed to win the match. CSPA finishes the season by winning both jamborees. Our next hurdle is the National regional Finals this coming weekend. Our girls’ squad will be playing in Bournemouth on Saturday and our boys will be playing in Bristol on Sunday. Good luck CSPA!